Yelena Polenova to Praskovia Antipova. 1883. 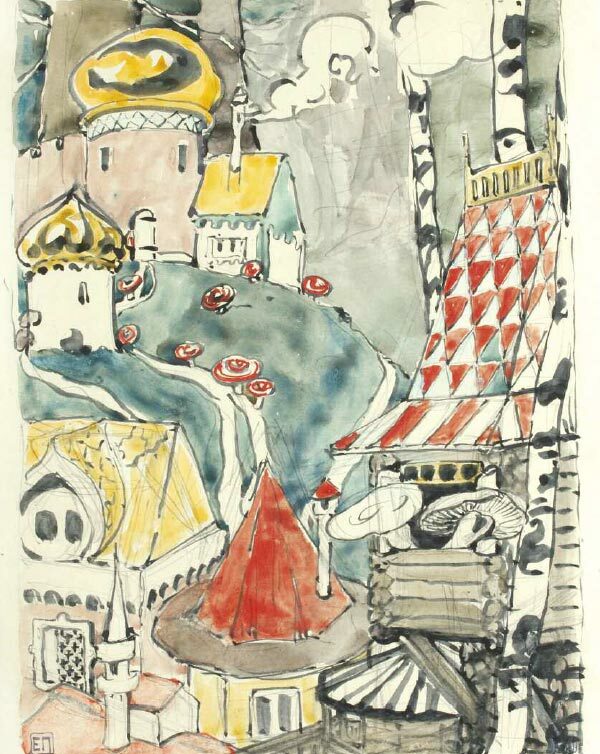 Yelena Polenova was gifted in graphics and drawing, painting, ceramics, and the decorative arts, as well as an accomplished collector, researcher and educator... Her diverse personality and creative quest has always posed certain challenges for scholars. In 1902 Natalya Polenova wrote a short book “Ye.D. Polenova”, that became the first and, for many years to come, the only attempt to give a comprehensive story of Polenova’s life in art. There are only a few paintings by Polenova housed at the museum; however, her drawings and sketches form a third of the museum’s graphic arts collection. 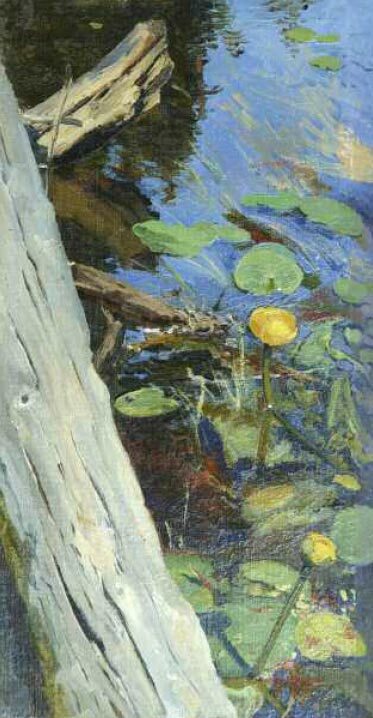 Most of them come from the private collection of the Polenov family — according to the artist’s will, her brothers Vasily and Alexei and her sister-in-law Natalya became the executors of her estate. In 1939, the Polenov heirs gifted the family art collections, including Yelena Polenova’s works, to the state. Sketches, rough drawings and notes from the funds of the Polenov Museum allow us to trace the artist’s path from apprenticeship to mastery, and her creative development; they help to fully understand the artist’s multi-faceted talent. 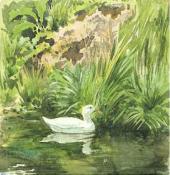 Even more importantly, sometimes they become instrumental in determining the proper meaning of her art without having to resort to guesswork — for example, the watercolour study “The Serpent” appears to be the conclusion, a “full stop” that the artist reached in developing the plot of her painting “The Beast. 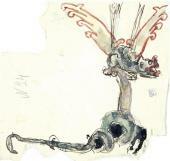 (Serpent)”. As an artist, Polenova was cast from a special mould. Her work was born of reflection and deep feelings. Extraordinarily emotional by nature but also quite reserved, she did not show her emotions in her everyday life, and kept everything deep inside — she was only open in her art. The artist’s personality was influenced by her large and talented family, the domestic atmosphere of which was very special — everyone was in some way involved in science or art. The family’s life was steeped in the most enlightened interests — the highest purpose of art, the artist’s noble mission, and the value of the classical heritage. The artist’s father, Dmitry Polenov, a lawyer and historian, was devoted to science; a bibliographer and scholar of ancient Russian chronicles, he became his daughter’s first history tutor. He singled her out as gifted and knowledgeable on the subject. Yelena was interested in her brothers’ university courses and studied law and mathematics; later her education was supplemented with courses in geology, mineralogy, ethnography, archaeology and literature. Maria Polenova, Yelena’s mother, was fond of drawing; in her youth, she had taken classes from Konstantin Moldavsky, a member of the Academy of Art, and became her children’s first art teacher. 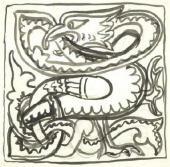 The parents encouraged their children’s interest in drawing. Yelena was nine when she and her siblings started taking classes from Pavel Chistyakov. 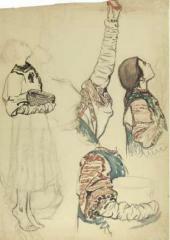 Five years later, she became a student of Ivan Kramskoi at the Drawing School of the Society for the Support of Artists. Elena became more and more interested in drawing; she took private lessons from Kramskoi and continued (intermittently) studying at Chistyakov’s studio at the Drawing School. In 1869-1870 Polenova studied in the Paris studio of the artist Charles Chaplin, who formed a high opinion of her aptitude: “You are gifted. <...> You have substance, which is more important, but your technical skills are lacking, and it is those skills that you need to acquire.”2 However, the portrait of her mother Maria, which Polenova painted at the age of 15, is a testament to her masterful skill, not just talent. 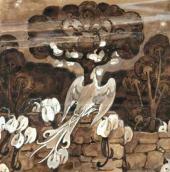 Having made the decision to paint “precisely, seriously and from nature”, Polenova never left her album behind. She spent considerable time around Russia, visiting villages like Imochentsy in Karelia, and Olshanka in the Tambov region. Years later, Polenova would call her life that of a “gypsy, a nomad”. 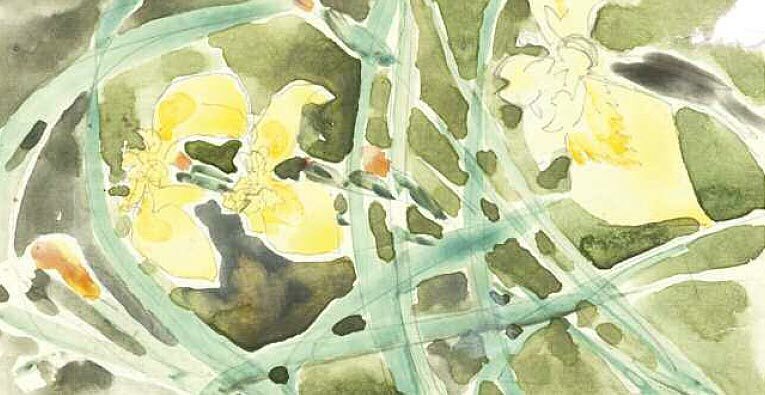 Her sketches and studies were filled with real-life images of the poetic, charming life of an old country estate that held so much value for her; she captured this much-loved world on the pages of her albums. 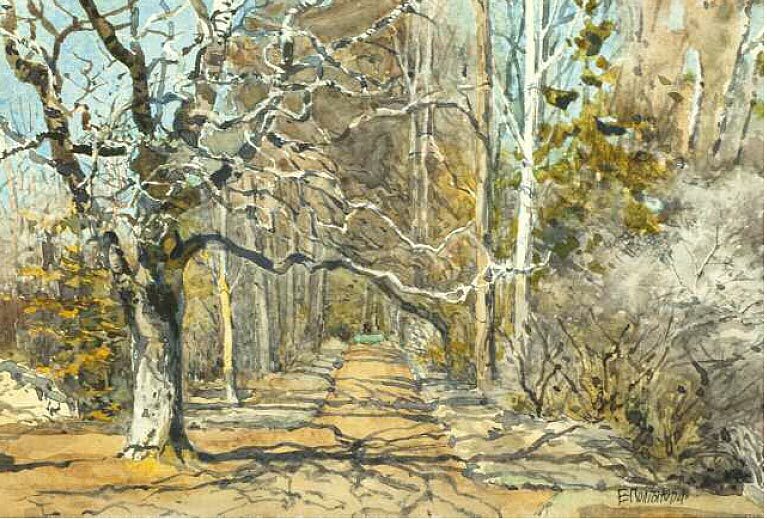 Polenova’s watercolours do not depict obviously striking landscapes; they are free of any exaggerated “prettiness”. Her art is a whole world in itself; her trusting, intense delight in the details creates the atmosphere of the paintings. 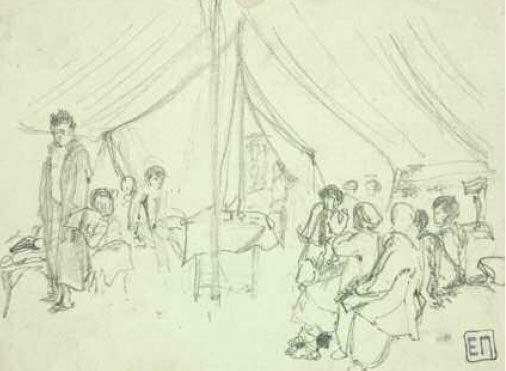 In 1877, during the Serbian-Turkish War, Polenova quit all her studies, went to Kiev, where her sister was in charge of the temporary “Hospital of the Round Tower” for the wounded, studied medicine, and worked long hours. Her personal drama ruined her life — the only thing left was her art; so she took the road of self-sacrifice, devoted her life to her craft, and carried on as a master artist. artistic outlook. Polenova did not keep a diary, to our great regret. What survives is her correspondence with those close to her, as well as some, albeit few, recollections of her. They allow us to come closer to appreciating her personality, to attempt to understand her as a human being and a creative individual, with all the challenges of her lot in life. Back in 1875 Polenova passed the rigorous examinations at the St. Petersburg education district (her preparation took much time and effort) and obtained the diploma of a home tutor. 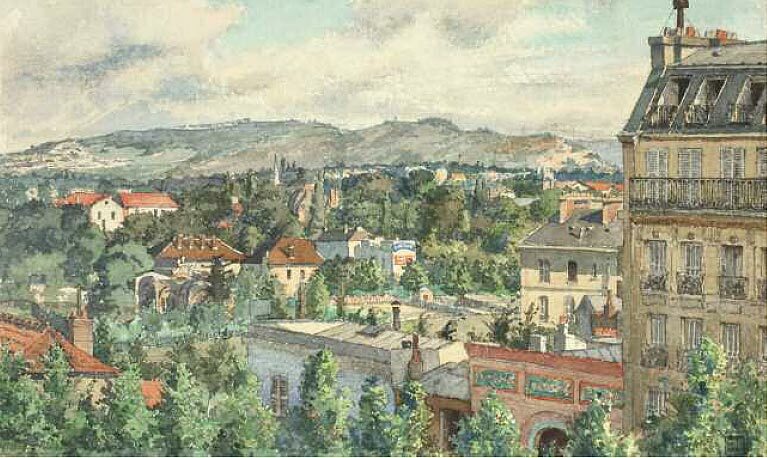 Polenova’s studies in Paris were serious and useful: over five months the artist gained considerable knowledge of painting on ceramic, as well as enamels; she had a chance to work in A. Egorov’s workshop, as well as Theodore Deck’s factory and Sieffert’s studio. Polenova’s outstanding professional skills allowed her to answer her older brother Vasily’s request to help him write an article on ceramics. 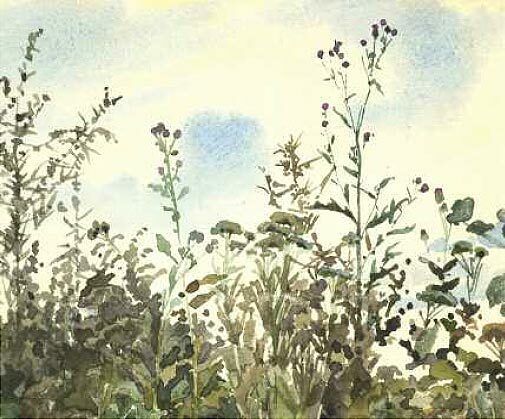 In the future Polenova would travel extensively, and her series of watercolours “Journey to the West, 1895”, with their exquisite palette, delicate sentiment and masterful implementation, proved a special chapter in the history of Russian watercolour painting. Due to her family circumstances, Polenova had to move to Moscow in 1882. She was very emotional over having to part with her friends, as well as having to abandon her professional plans (she had been offered to head the ceramics class at the Society for the Support of Artists); she was also apprehensive of her brother’s artistic influence. However, in her letter from Paris she had anticipated that the move would mark the end of the period of apprenticeship; that it was Moscow where all her accumulated artistic experience was to be realised. She found herself surrounded by young artists, friends and students of her brother Vasily; Vasily’s wife Natalya became her closest friend for the rest of her life. Polenova also became close to the Mamontov family and for many years found inspiration at their estate at Abramtsevo. She also found a good friend in Yelizaveta Mamontova, who was able to somewhat soften the artist’s suspicion and distrust of the world and people. It is worth noting that Polenova’s decorative patterns became an integral part both of her fairy tale illustrations and other artwork. 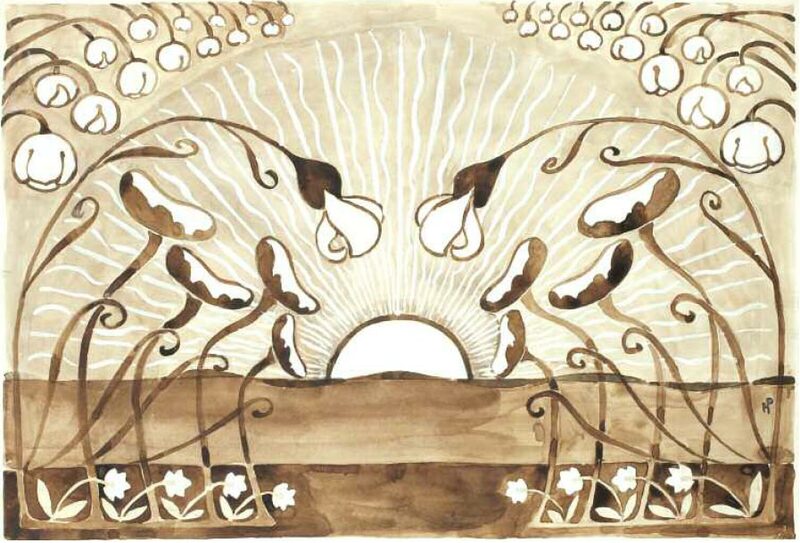 In her designs for carpentry, in her illustrations, and in her decorative patterns, the artist created the style which would later be called “Russian art nouveau”. Such freedom of imagination, such refined artistic taste and style was unprecedented in Russian art before Polenova. 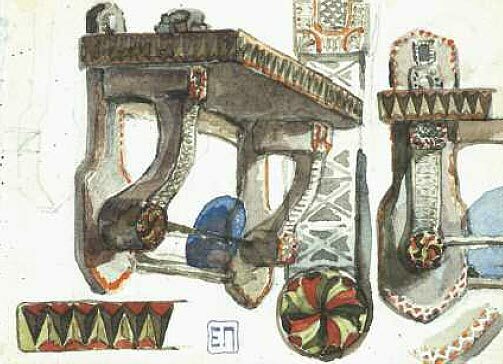 As we contemplate Yelena Polenova’s heritage today, the impact of her art, especially her drawings and decorative objects, is remarkable. Benois, Alexander. “A History of Russian Art in the 19th Century”. St. Petersburg, “Znanie” Publishing House. 1902, p. 254. Letter from YD. Khruschova to V.D. 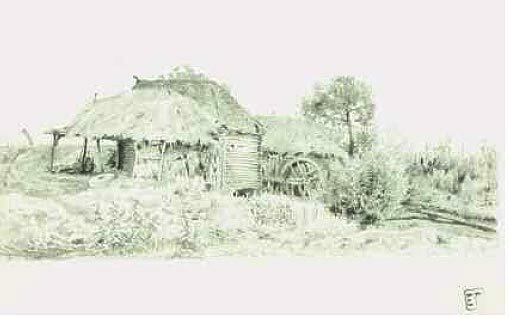 Polenov. Paris, June 29 1870. Ye.V. Sakharova. “Vasily Dmitrievich Polenov. Yelena Dmitrievna Polenova. 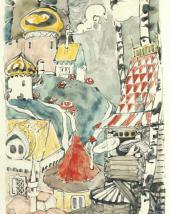 A chronicle of the artists’ lives.” Moscow, “Isskustvo” Publishing House. 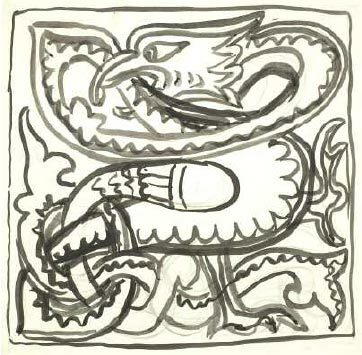 1964, p. 65. Letter from Ye.D. Polenova to V.D. Polenov. March 27 1887. Manuscripts Department, Tretyakov Gallery. F 54, item 1, file 3927. Fund 1. Museum Documents at Polenov Museum Reserve. Item 434, pp. 4-6. Letter from Ye.D. Polenova to YD. Polenov. St. Petersburg, February 15 1880. Manuscripts Department, Tretyakov Gallery. F. 54, item 1, file 3947. Letter from Ye.D. Polenova to V.D. Polenov. Paris, November 12/24 1880. Manuscripts Department, Tretyakov Gallery. F. 54, item 1, file 3949. Letter from Ye.D. Polenova to P.D. Antipova. Moscow, June 22 1883. Manuscripts Department, Tretyakov Gallery. Item 1, file 6860, p. 18. Letter from Ye.D. Polenova to V.V. Stasov. Moscow, April 2 1894. Ye. V. Sakharova. “Vasily Dmitrievich Polenov. Elena Dmitrievna Polenova. A chronicle of the artists’ lives”. Moscow, “Isskustvo” Publishing House. 1964, p. 497. Letter from Ye.D. Polenova to P.D. Antipova. Moscow, October 25 1896. Ye.V. Sakharova. “Vasily Dmitrievich Polenov. 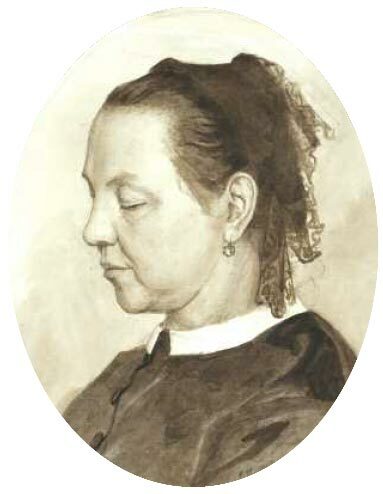 Elena Dmitrievna Polenova. 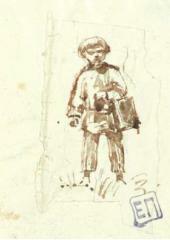 A chronicle of the artists’ lives.” Moscow, “Isskustvo” Publishing House. 1964, p. 373. Ye.F. Junge. Remembering Ye.D. Polenova. “ Russian Antiquity. ” June 1912, p. 37. “Draft statement of wishes of the deceased Ye.D. Polenova compiled by her relatives” December 1899. Fund 1. Museum Documents at Polenov Museum Reserve. Item 438. Sergei Makovsky. Profiles of Russian artists. Moscow, 1999. “Respublika” Publishing House; pp.156-157. A Boy Carrying Food to the Field. Olshanka. End of 1870s - early 1880s.